This is a continuation of the debrief from the Brand Managecamp conference. In my last post, I relayed insights about Innovation from the “elite conference on branding” that I attended in Las Vegas last week. Today I’m covering the 2 remaining themes that arose – both fall under the category of “stuff that matters”: Substance (meaning, mission, authenticity, integrity) and Results (ROI, accountability, behavior, reality). • John Gerzema, Chief Insights Officer of Y&R and author of The Brand Bubble, explained emerging cultural values that call for more substantive management approaches. For example, the rising emphasis on ethics and fair play requires a consumer strategy rooted in empathy and respect. Therefore the management principle is to deliver both value and values. John pointed to BMW which has adopted a strategy of “design in the context of modesty” and GoreTex which operates a very flat organization – both are producing products that are more in line with today’s consumers’ expectations of authenticity and integrity. 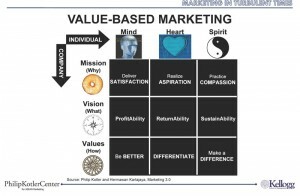 • Marketing legend and Kellogg professor Phil Kotler introduced “Marketing 3.0” aka Value-Based Marketing and the following grid that outlines how a company engages customers on all levels (mind, heart, and spirit) through its mission, vision, and values. He used S. C. Johnson as an example of a company who has transitioned to this more meaningful approach, wherein their mission of “Contributing to the community well–being as well as sustaining and protecting the environment” is more than the corporate social responsibility platform — the “soul of the company is concerned with the shape of our world,” explained Kotler. • Even Guy Kawasaki’s presentation on intrapreneurship touched on the importance of Substance. Guy advanced the notion that companies that want to make “meaning” are more successful than those that only want to make money. • Jonathan Salem Baskin, author of Branding Only Works on Cattle and the Dim Bulb blog, advocated for a behaviorally-driven approach to brand development. He spoke of brands as transactions of reality – after all, consumers live in reality and decide what to buy/do/make/etc. in reality – and argued that brand equity should be measured transactionally. Understand ‘What’ Before ‘Why’ – that is, understand what makes consumers act. Instead of promoting “virtual consumption” (a term coined by former Coke leader Sergio Zyman to describe a shift in consumer attitude but not behavior), a marketer’s approach should be to understand the things that lead people to buy the product and then to do more of those things. Conversation Needs a Purpose — despite all the hype about the conversations that social networking tools make possible, conversations themselves are agnostic – it’s how we use them that makes them valuable. We should use them to drive behavior – and we should measure their value by how they impact behavior. focus on decision-making – change the conversation between marketing and finance – replace the typical silo-based view of investments with the tools and language to allow all senior players across functions to engage in the debate about marketing investment. Michael advocated being disciplined about articulating a clear path to value – from marketing intent to value creating behaviors to present and future business results – and briefly described approaches for doing so. I’m sure his book provides great advice and instruction on this, so I can’t wait to read it. Hopefully that gives you a good sampling of the great content from the Brand Managecamp conference. I encourage you to listen to the podcast below to hear actual excerpts from these presentations. I’m still processing all that I learned so you’ll probably see the themes of Innovation, Substance, and Results in future posts — but for now, comments are open for feedback and questions.